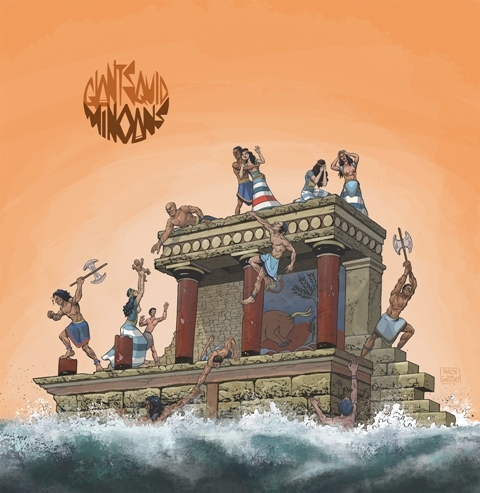 San Francisco progressive doom-rock scientists, GIANT SQUID will release their anxiously-awaited fifth LP Minoans October 28 via Translation Loss Records. Recorded and mixed with engineer Tim Green (Earthless, Melvins) at Louder Studios in Grass Valley, CA, the record sees the avant-garde band at their most refined, focused and vital as it fully embraces its Mediterranean leanings and lyrically excavates one of the earliest civilizations known to history; examining how the aquatic demise of the ancient proto-Greek people may foretell our own end. Minoans is the follow up to GIANT SQUID’s 2011 release Cenotes, an album that was hailed as “science sludge” by Pitchfork and “earthy, experimental doom metal à la Neurosis” by Revolver. GIANT SQUID has been wielding palatial vocals and enormous waves of cello, keys, and exotic sludge riffs for over ten years, garnering universal critical acclaim. On Minoans, marine biology and natural history metaphorically collide with heartbreaking stories of historic human tragedy; resulting in some of the most emotional and sincere music being made today in any underground scene. Recorded this past June and tested live over the summer supporting like-minded peers YOB, Minoans is crushingly heavy, exotically beautiful, a musical; GIANT SQUID’s finest hour to date. Conceptual artwork created by guitarist / vocalist Aaron John Gregory adds to soaring scope of this ambitious album. Check out an interactive art piece on the demise of the Minoans HERE. Giant Squid make "Sixty Foot Waves"